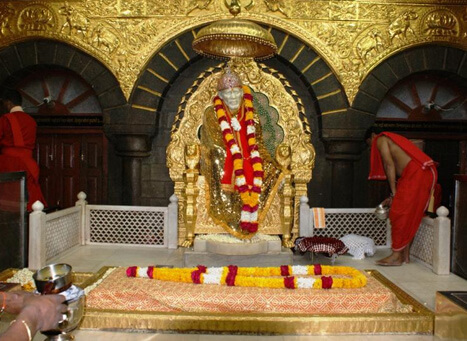 Abode of the revered saint -Shri Satchidanand Sadguru Sainath Maharaj, affectionately known as ‘Saibaba’, Shirdi is a popular attraction in the pilgrimage circuit tour of Maharashtra. Hardly 83 kilometers from the city of Ahmednagar, Shirdi draws people from all walks of life, who believe that their requests will be granted by the saint. According to locals, a mysterious ‘fakir’ (a wanderer, regarded by devotees as Shirdi Sai Baba) came to Shirdi in his teens and lived there for more than 60 years. Gifted with the magical ability, the ‘fakir’ was a master ‘yogi’ who used to demonstrate his skill upon many occasions. It was simply because of Sai Baba's simple living and high virtues that drew devotees to Shirdi even today. Initially, Saibaba used to stay under a Neem tree, on the outskirts of Shirdi, which is now known as Gurusthan. Later he shifted to an abandoned mosque in Dwarkamai, and then to Lendi Baug. Currently, all these places are now converted into pilgrim centers and are must visit on a trip to Shirdi. Locals say that Sai Baba used to embodied all the religion and used to preach the universal religion of love and compassion. In Shirdi, tourists can visit a 200 square meters temple complex, which features Samadhi Mandir, Khandoba temple, Gurusthan, Dwarkamai, Chavdi, and Lendi Garden. Samadhi Mandir, final resting place of Saibaba, was built by Shri Gopalrao Butti of Nagpur, one of the firm devotee of Sai Baba. Made entirely of stone, Samadhi Mandir has a huge ‘samadhi’ and the statue of Saibaba. Right in front of the temple, there is a huge hall that could accommodate more than 600 devotees. Also, there is an area where tourists can find book centers and ‘prasad’ outlet to cater to the devotees. Besides, there is a separate hall for meditation. Towards the right side of the Samadhi Mandir, there is a Gurusthan, literal meaning “place of the Guru.” Gurusthan was the place where Sai Baba spent most of his time when he came to Shirdi. Here one can find a tomb of Sai Baba under a Neem tree. Locals say that there is a tunnel under the neem tree, which ends directly at Dwarkamai, the place where tourists can see an abandoned mosque, which was once the abode of Sai Baba. Inside Dwarkamai, towards the left of Samadhi Mandir, tourists can see some possessions of Sai Baba like few pieces of cloth, chillim pipes, a stick, a begging bowl, and a change of kafni. Also in the temple complex, there is Lendi Garden. A sprawling garden with water bodies and flower beds, Lendi features tombs, shrines, and two lamps lit by Baba. Local say that each day Sai Baba used to visit Lendi Garden to listen to the call of nature. On an average, Shirdi receives an average footfall of 70,000-75,000 devotees, each day. For tourists, the Shri Saibaba Sansthan Trust provides accommodation in 2,500 rooms. Each day, the community kitchen in the Shirdi offers food to up to 40,000 devotees. 10:30 PM: Shejarati -Shej (night) Arati; after this, a shawl is wrapped around the statue in the Samadhi Mandir, a Rudraksha mala is put around baba's neck, Mosquito net is hung, and a glass of water kept there. Locals say that that Saibaba asked devotees only to celebrate Guru Purnima. Besides, Ramnavami, Shirdi Vijayadashmi, and, Urus are celebrated with full devotion in the temple. During Guru Purnima, a Vyasa Puja is organized in honor of Ved Vyasa who wrote the epic Mahabharata. During the festivals like Ramnavami, Shirdi Vijayadashmi, and, Urus, a special puja takes place at the temple, and grand processions, carrying the palanquin and the Rath, is also organized. From dawn to dusk, Shirdi remains illuminated with all night bhajan and qawwali sessions. Tourist can contact the Sansthan Office about the festival celebration that takes places in the temple. To reach Shirdi, Sainagar Shirdi is the closest railway station. Trains from different corners of India like Chennai, Mumbai, Visakhapatnam, and Delhi are available to reach Shirdi. State-run buses are also available from the nearby cities like Kopargaon (15 kilometers), Ahmednagar (83 kilometers), Manmad (87 kilometers), and Nashik (119 kilometers). From the railway station, tourists can easily get buses to reach the main temple complex.